For the best results, perform stain tests simultaneously on a variety of sealers. The key element of a concrete countertop that affects its aesthetics, its performance and your reputation as the fabricator is often not the concrete itself, but the sealer. Nearly every characteristic that draws people to concrete countertops and influences their opinion of them can be traced back to the sealer. The primary role of a concrete countertop sealer is to protect the concrete from stains and etching, but it also affects the concrete's color vibrancy, sheen, tactile feel and texture. So much depends upon the sealer, yet too often concrete countertop makers expend very little effort in selecting the right sealer for the job. When a client comes to you inquiring about your concrete countertops, an essential part of the conversation should be about expectations, such as shape, form, color and decorative embedments. But part of this discussion ought to be about the finish, addressing such questions as: How will it perform? Will it stain? What kind of maintenance is required? To come up with the answers—and give your clients the countertops they expectthe only way is to test the sealer first so you understand its capabilities and limitations. Why Do You Need to Test?Sealers are sealers, after all, and selecting one should be an easy process, right? Unfortunately it's not that simple. There are many complex and conflicting reasons for choosing one sealer over another, and these reasons prevent a single sealer from becoming the "best" product for every situation. Often selecting a sealer requires a compromise between looks, cost, ease of application and performance. The first three factors are fairly straightforward and obvious, but performance is a complex issue that can't be easily predicted or assumed. Testing is an easy and accurate way to verify that a sealer does what you expect it to do. Often the application method, the number of coats and other factors peripheral to the sealer itself have a strong influence on its performance. Relying solely on the recommendations of others and their subjective, second-hand information can lead to problems down the line. Unless you put a sealer through its paces yourself, you won't know its limitations or its capabilities, and more importantly, you won't be able to confidently communicate with your client. You can't set your client's expectations about your concrete and how it will perform if you don't know that yourself. Setting expectations about how a countertop sealer will perform in the long run with regard to staining, etching, scratching, heat resistance and maintenance are vital to the end result and the key to long-term client satisfaction. Simply explaining to clients what a sealer is often doesn't provide enough information about how that finish will perform. Clients are then likely to form their own expectations, which may not match what you can deliver. The only way to fully understand the capabilities and limitations of your sealer—and properly set your clients' expectations—is to test it. Testing is a simple, easy and realistic way to evaluate a sealer you're considering or to learn about the sealer's performance so you can develop language to use when speaking with a client. How to Test for Stain and Etch ResistanceTesting determines how a sealer will perform in a client's home. It should represent real-world situations, it should be simple and easy, and it should be controlled and repeatable. I've created a straightforward stain/etch test procedure that uses 14 common staining agents found in almost any home. While not exhaustive, the selection represents various staining agents that reveal the weaknesses and limitations of many sealers and separate out the high-performance ones from the mediocre. The testing procedure simulates spills left on for various lengths of time. This is important, because not all spills are cleaned up immediately and sometimes they're not noticed for a long time after the spill occurs. Because sealers react differently to different substances left on for different exposure times, I've come up with a way to objectively evaluate the sealer's performance, score the results, and make the scores from different sealers directly comparable. This way it's possible to evaluate the performance of a penetrating sealer with a topical product, for example. The 14 Staining Agents to Test ForFourteen substances are used in my stain testing procedure. They represent a range of commonly encountered materials and include harsh staining agents, solvents, acids and cleaners. Sample ready for testing, marked with staining agent numbers (bottom) and exposure times (left edge). The photo shows the effects on a sealer of different staining agents after different lengths of exposure time. Some, like #6 (alcohol) and #7 (acetone), affected the sealer after only 15 minutes of exposure. Others, like #2 (red wine) and #3 (coffee) didn't stain the concrete until after more than 1 hour of exposure. And #5 (water) took almost 24 hours to affect the sealer. The Testing ProcedureAll fourteen different staining agents are applied to sealed concrete samples and left on for different time intervals: 15 minutes, 1 hour, 8 hours and 24 hours. First, prepare the concrete sample (or samples) and seal it exactly as you would seal your countertops. Make sure your sample is large enough to test all 14 agents at once. I find it easiest to use two 12 x 18-inch samples or one larger sample that's at least 12 x 30 inches. 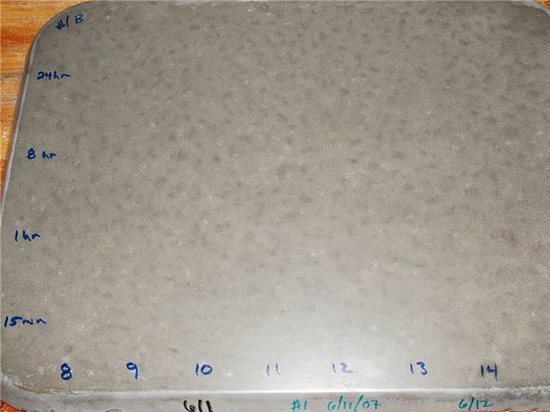 For identification, assign a number to each staining agent, and write these numbers across the bottom of the sample. Along the left edge, write the exposure times. Leave a space about 2 inches between each number to make it easier to place and clean up each staining agent without disturbing the others. All of the staining agents are liquids. Some, like mustard, are thick and don't run. Others, like alcohol, are thin and evaporate quickly. 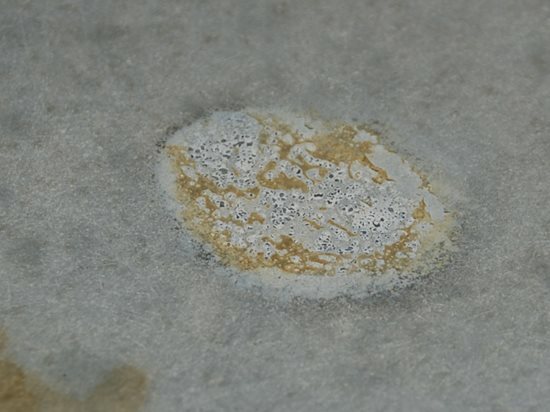 To keep the samples tidy and the staining agents from running and mixing with each other, dip a cotton ball into each staining agent and place the wetted cotton ball onto the concrete. The cotton balls ensure the staining agent stays in place, and they serve as a reservoir, slowing evaporation. To further slow evaporation of volatile agents, like acetone, place a glass, bottle or other heavy impermeable object on top of the cotton ball. This helps seal in the liquid to keep it from evaporating. This also simulates what would happen if a bottle of that liquid leaked or spilled, and the liquid ran under the bottle. When testing, it's important to look at different exposure times because not all stains and spills get cleaned up immediately. Different sealers react differently over time, and looking only at one exposure time may not reveal the sealer's full performance characteristics. After the allotted exposure time is up, remove the cotton ball, wipe off the residue with a damp cloth and clean up the remaining residue with a mild detergent. Let the sample dry before evaluating. Some sealers allow moisture to penetrate and darken the concrete, but with no permanent damage caused by etching or staining. Let the darkened spot fade before evaluating. To check to see if the sealer is damaged, wet the area with water. 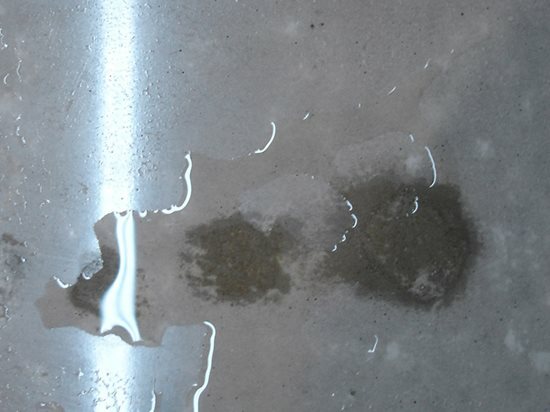 If the tested spot darkens much quicker than the surrounding concrete, then the sealer was damaged by during testing. These tests help reveal the weaknesses of a sealer under realistic but harsh conditions. Most of your clients will not allow staining agents to sit for 24 hours. But there's always the possibility that a bottle of oil sitting on the countertop will leak or drip and go unnoticed, or a party guest may cut limes on the countertop and the juice won't get cleaned up until the next day. These scenarios are real, and even the most fastidious client who accepts a finish that "acquires a patina" from daily use may not be happy about a severe etch mark or prominent oil stain. How to Score the ResultsIf you plan on testing a variety of different sealers to see how they perform, I've developed a scoring method that objectively evaluates the results and allows you to compare the performance of different sealers. It is based on simple criteria, such as "did it stain or didn't it." Scores are calculated just like grades in school. A sealer that resists all 14 substances for 24 hours and shows no damage, etching or staining gets a perfect score of 100%. Likewise, a sealer that is severely affected by everything at all exposure times scores very low. As a reference, bare concrete scores 59% overall, as shown in the table. So any sealer that scores below 59% is actually affected by more agents than bare concrete is. Bare concrete is most susceptible to etching from acids, so a very low score is expected. Without a sealer, bare concrete is porous, so it's also expected that stains can be a problem. Solvents and cleaners will, over time, affect the concrete. Higher scores here show that the effects are not as severe as with harsh stains or acids. You don't need to score the samples in order to see the performance of the sealer. 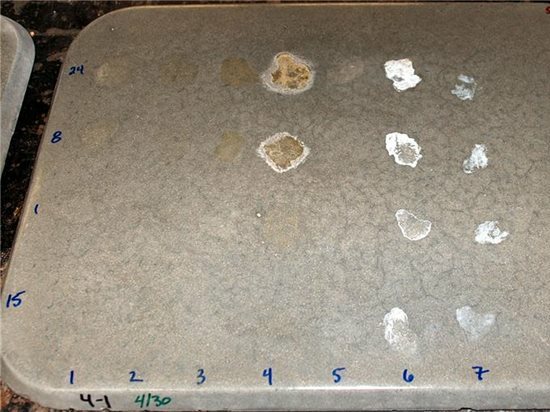 But if you are interested in scoring multiple sealer samples in order to compare them, the details of how to score are explained in my article How to Test Concrete Countertops for Stain Resistance (PDF), available on the Concrete Connections website. 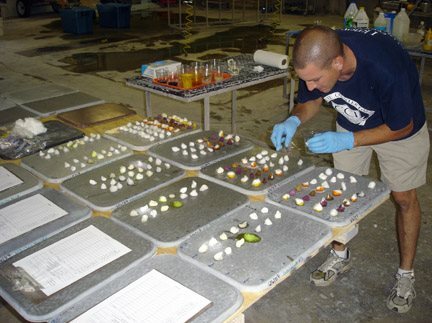 The Results of Our Stain TestsThe Concrete Countertop Institute (CCI) performed extensive stain tests on 27 different sealers, which included multi-component catalyzed systems, single-component products, reactive sealers, penetrating treatments and wax. Keep in mind that not all of the strengths and weaknesses of the sealers are quantified or addressed in CCI's sealer testing program. This was a test only of stain and etch resistance, so the ranking is not an indication of the overall desirability of a sealer. Other factors such as appearance, ease of application, cost, environmental impact and ease of repair were not tested. However, these factors are also important when choosing a sealer to use on your concrete countertops. The best stain protection was provided by coatings, including waxes, hardeners and repellants. No penetrating sealer treatment provided anywhere near the protection than did an average-performing coating. For coatings, the best stain protection was provided by highly chemical-resistant products such as urethanes and epoxies. On average, acrylics and reactive sealers faired poorly. The best acrylic performed about the same as the poorest performing epoxy. It should be evident by the results that not all sealers provide the same degree of protection. It's up to you to decide how much protection is required for a particular application. Fireplace mantels and bathroom vanities, for example, have different performance requirements than kitchen countertops, so a sealer that would fair poorly in a kitchen might be fine on a bathroom vanity.